Jasmin was the project architect at dRMM, working with Alex de Rijke, for Maggie's Oldham which opened in June 2017. Maggie’s Centres seek to provide ‘the architecture of hope’. They offer free practical and emotional support for people affected by cancer. Built in the grounds of NHS cancer hospitals, the centres are safe and welcoming spaces. They lift the spirits and set the scene for people to draw on strengths they may not have realised they had in order to cope. Maggie’s Oldham is a simple yet sophisticated wooden box of surprises. Raised on six slender columns, the building floats above a garden framed by pine, birch and tulip trees. From a central oasis, a tree grows up through the building, bringing nature inside. 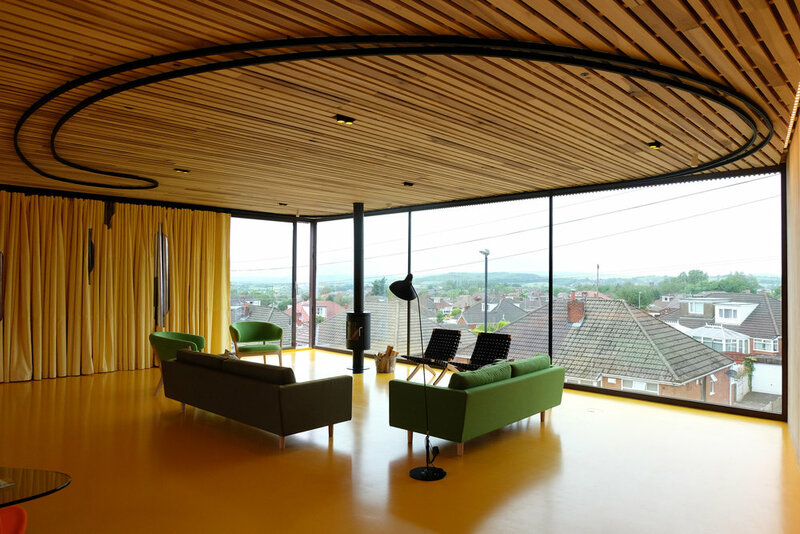 On entering, the visitor is met with a space, light and unexpected views down to the garden below, up to the sky, and out to the Pennine horizon. The curve of the glass at the entrance hugs you as you enter - the leaves of the tree are a lovely surprise. A 'pause space' library nook allows you to hide for a moment if you feel momentarily nervous to come in. 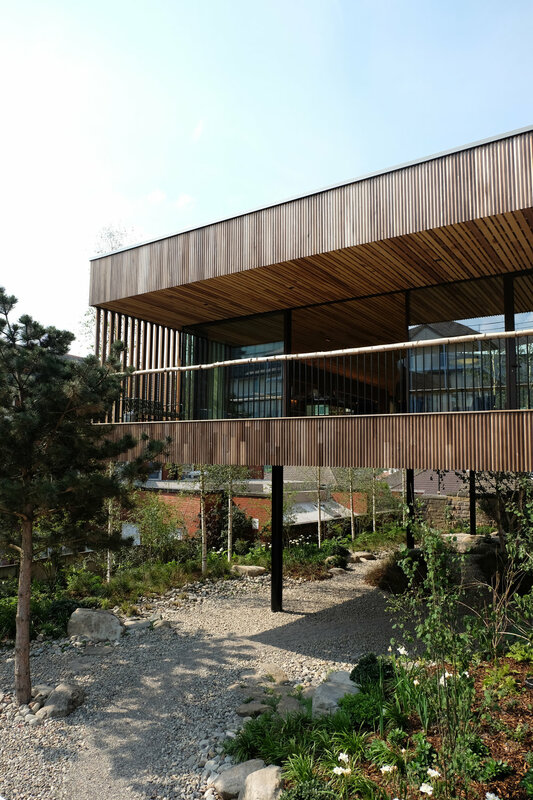 Maggie's Oldham is the first hardwood cross laminated timber building in the world. The walls are essentially 'big plywood', made from strips of tulipwood. The kitchen table is the heart of the Maggie's Centre. 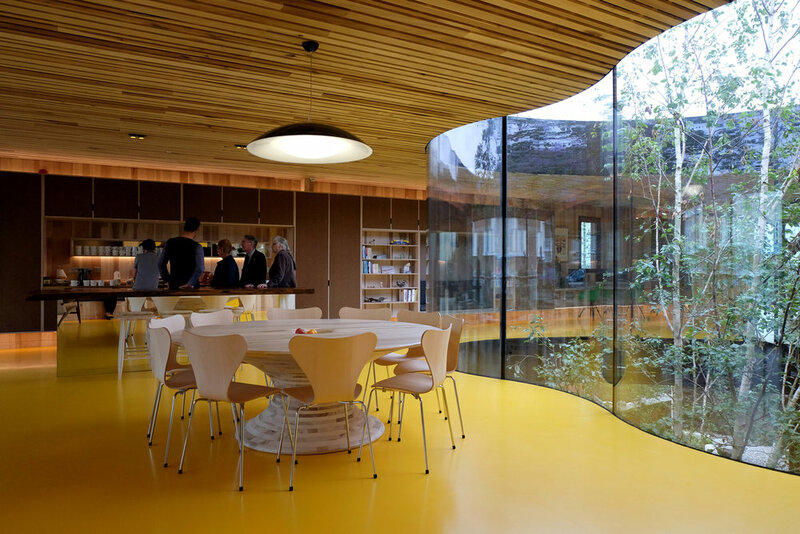 The base is made from the tulipwood CLT door cutouts - nothing wasted.The kitchen table is a place to sit and read; a place or talk to other people; a place to find support from professional experts. You can walk into Maggie’s at any time, make yourself a cup of tea and sit down at the kitchen table to think, talk, laugh, cry or simply take a quiet moment. Visitors are always welcome at Maggies' kitchen table; it’s a place for everyone. Raising the building on legs allows for an optimistic view of the horizon and the Pennines in the distance.